You will need Node and npm installed on your machine. A basic understanding of Angular is required. We’ll be creating a realtime paint application. Using our application, users can easily collaborate while working on the application and receive changes in realtime. We’ll be using Pusher’s pub/sub pattern to get realtime updates and Angular for templating. This command is used to initialize a new Angular project. Let’s create a post route named draw, the frontend of the application will send make a request to this route containing the mouse events needed to show the updates of a guest user. We’ll be attaching a directive to the canvas element. Using the directive, we’ll listen for events on the host element and also bind attributes to it. Run ng generate directive canvas to create the canvas directive. Open the canvas.directive.ts file and update it with the content below. // We use the ElementRef to get direct access to the canvas element. Here we set up the properties of the element. // We create a canvas context. // This object will hold the start point of any paint event. // Get the offsetX and offsetY properties of the event. // Make a request to the server containing the user's Id and the line array. We are making use of HostListener decorators to listen for mouse events on the host elements. Methods are defined for each event. In the onMouseDown method, we set the isPainting property to true and then we get the offsetX and offsetY properties of the event and store it in the prevPos object. The onMouseMove method is where the painting takes place. Here we check if isPainting is set to true, then we create an offsetData object to hold the current offsetX and offsetY properties of the event. We update the position object with the previous and current positions of the mouse. We then append the position to the line array and then we call the draw method with the current and previous positions of the mouse as parameters. The onMouseUp and onMouseLeave methods both check if the user is currently painting. If true, the isPainting property is set to false to prevent the user from painting until the next mousedown event is triggered. The makeRequest method is the called to send the paint event to the server. makeRequest: this method sends a post request to the server containing the userId and the line array as the request body. The line array is then reset to an empty array after the request is complete. In the draw method, three parameters are required to complete a paint event. The previous position of the mouse, current position and the strokeStyle. We used object destructuring to get the properties of each parameter. The ctx.moveTo function takes the x and y properties of the previous position. 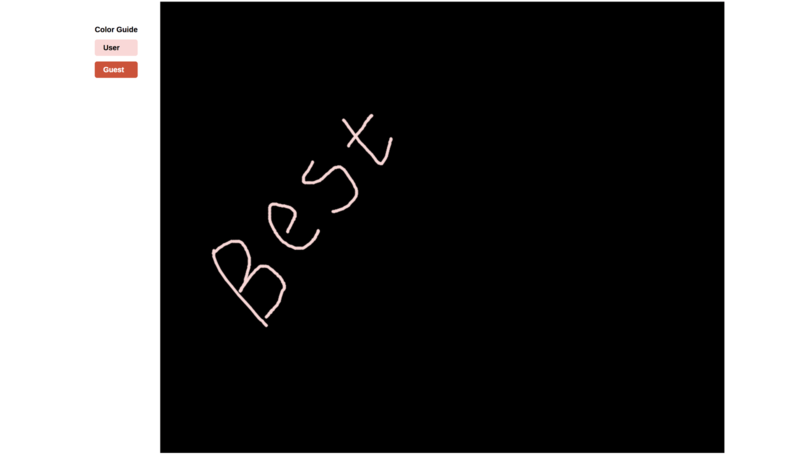 A line is drawn from the previous position to the current mouse position using the ctx.lineTo function. ctx.stroke visualizes the line. We made reference to the HttpClient service. To make use of this in the application, we’ll need to import the HttpClientModule into the app.module.ts file. We’re making use of an external font; so let’s include a link to the stylesheet in the index.html file. Let’s include the Pusher service in the canvas.directive.ts file to make use of the realtime functionality made available using Pusher. Update the canvas.directive.ts to include the new Pusher service. In the AfterViewInit lifecycle, we initialized the Pusher service and listened for the draw event. In the event callback, we check if the there’s a distinct userId. Then we loop through the line property of the data returned from the callback. Wed proceed to draw using the start and stop objects properties of each position contained in the array. Note: Ensure both the server and the Angular dev server are up by running ng serve and node server on separate terminal sessions. 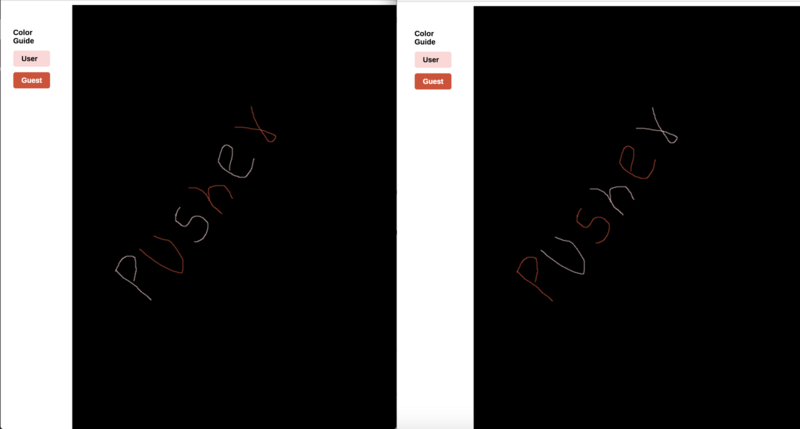 We’ve created a collaborative drawing application in Angular, using Pusher to provide realtime functionality. You can check out the repo containing the demo on GitHub.